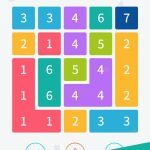 Colorzzle is an award-winning puzzle game, which is available to purchase for a small fee and can be played on Android and iOS mobile platforms. 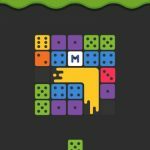 The goal of the game is to lay down colored blocks in a certain pattern in order to make matches. Matching colors will make flowers and trees grow. Once you have all the trees and flowers in place, the puzzle is solved. The game follows a minimalistic aesthetic that helps players relax while still keeping things interesting. There are over a hundred stages for you to solve, each one more difficult than the last. As you progress in the game, you will additional mechanics, including switches, rotating blocks, and rainbows. You will need to analyze everything carefully and plan your moves ahead if you want to succeed in this game. 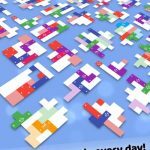 If you find yourself struggling to complete a puzzle, you can always rely on our Colorzzle tips, tricks and hints on how to clear all stages! The blocks on the board can be moved and switched from anywhere. Just tap on the blocks you want to switch consecutively. Don’t be afraid to move blocks that already have plants growing on them. What is important is that you position all the blocks correctly. To ensure that you can stay on track with the positioning of the blocks, just use the colors in the rainbow as your guide. Work with a couple of colors first that you know will be positioned together. For example, you can start with red, orange, and yellow blocks first since they are the first three colors of the rainbow. Pillars are the equivalent of obstacles in Colorzzle. They cannot be moved or swapped with other blocks. 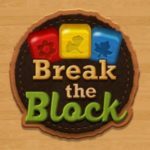 To ensure they do not interfere with the rest of your puzzle later on, it is a good idea to start with laying down blocks around them. This way, you can work your way outwards, and not worry about them blocking your pattern. Color beams are used to reach pillars that do not have adjacent blocks. Even if there are no blocks next to a pillar, you should still follow our previous advice. Start by aiming the colored beams at the pillars to set the direction, then head towards the secondary colors. This way, you will still be able to complete the color mixes that you need. When you reach higher stages, you will be encountering flips and rotators. These are special blocks that give you access to different colors. You can cycle through flipping blocks as much as you want until you get what you need. As for rotating blocks, you need to make sure the colors line up correctly, or they won’t work. Just focus on the color relationships and work on them one at a time to avoid confusion. There are two types of mirrors in the game. The first type is placed on a round tile. This type of mirror cannot be moved, but it can be rotated to direct a beam. The second type is on a square tile, which indicates it can be swapped around like a regular block. Keep in mind that you need to hit all the mirrors in a stage in order to solve the puzzle. Keep moving the mirrors round until you can hit them all. Rainbow blocks are like bonus blocks in Colorzzle in the sense that you can place them anywhere without worrying about color patterns. The one catch is that they need to be beside at least one solid-colored block. With that in mind, make sure you maximize the utility of these rainbow blocks by placing them strategically. Normally, a cross-shaped pattern is a good idea. Just place a solid block in the center then surround it with rainbow blocks in order to spawn the most trees and flowers. Create serene gardens while solving color puzzles in Colorzzle! Just follow the strategy guide above in order to complete all the stages! Also, if you’ve come across any other tips or hints for the game, don’t hesitate to share them with us below in the comment area!